The Bangellame is much more than just another children's fairy story. 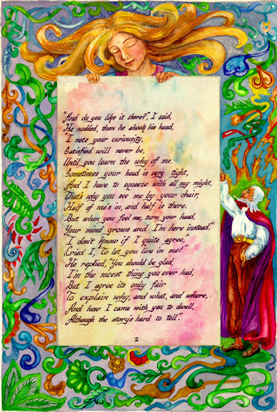 Every page is decorated with naturalistic Blake-like figures and intricate scrollwork, such as that displayed in the left hand margin of this webpage. Each verse is written in fine calligraphic script, and there are several hidden meanings behind many of names of the characters. 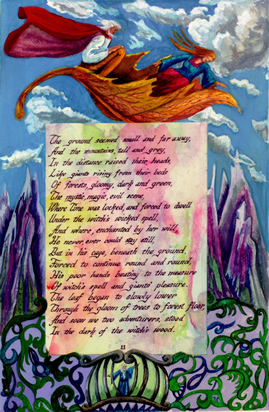 The story tells of how the author, together with her friend Benkly Bingle, journey into the realm of imagination, crossing the Sea of Strife to unlock time and free the children from the Hill of Childhoods Cry. The Bangellame is also about acquiring personal freedom. It is a criticism of the drudgery endured by the working class population, the live to work ethic, and greed. 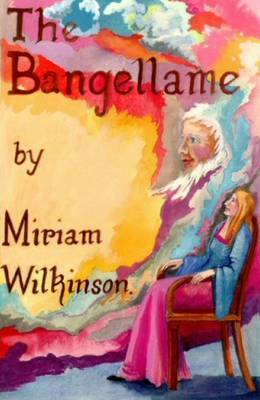 Miriam started work on The Bangellame in the late sixties, and did not finish the illustrations until the mid seventies. The publishing companies that she approached only offered to publish the book in black and white. Printing the book in full colour was apparently too expensive and therefore not profitable enough. Miriam decided to wait until her illustrations could be published in full colour, but unfortunately that never happened during her lifetime. The Bangellame was finally published on 5 Sept 2009, almost 20 years after Miriam's death. This is all thanks to the efforts of Brett Wilson, who after having approached several well known publishers, decided to set up his own company and publish the book himself. "Miriam has embraced the heart and imagination of the child and created a world which few have the imagination or perseverance to do. The whole book is awash with colour and texture. The grand depictions of mountains and sea are like landscapes to dwarf the protagonists, just as humans are dwarfed by society and machines. You are astonished again and again as you turn each page." The two pages below are from The Bangellame. Click on the images to enlarge them, and then click them again to return back to this page. Click here to read an interview with Brett Wilson.